At Savannah National Wildlife Refuge on Sunday and on Tybee today, the wind was blowing and the winter birds were present. At SNWR, the grassy areas were once again hopping with sparrows. I found Savannah, White-throated and Song. 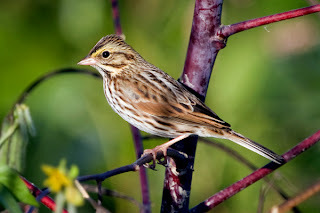 Also hopping about like sparrows were many Palm Warblers. 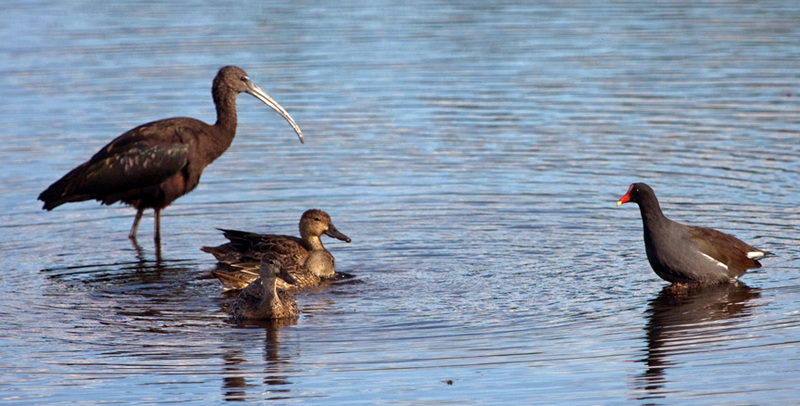 I saw a male northern harrier, many glossy ibis, small flock of shorebirds and even some duck – blue-winged teal and ring-necked ducks. On the beach at the full moon high tide, the strong cold wind was churning up white caps at the north end. The flock of black skimmers on the beach was amazingly large - probably between 500 and 1000 birds. 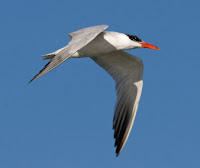 Black skimmers on the beach and in the air! 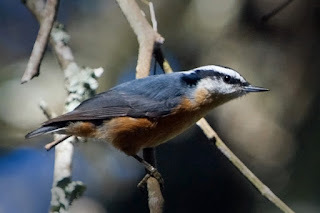 In the pines and wax myrtle along Polk Street I found a phoebe, pine warblers, yellow-bellied sapsuckers, yellow-rumped warblers, ruby-crowned kinglets, palm warblers, and a pair of red-breasted nuthatches. 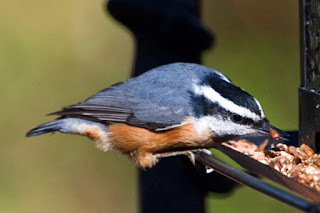 Back at my house on Spanish Hammock, the first thing I heard was the nasal honking of a pair of red-breasted nuthatches. Much to my surprise and delight, they had found my feeders and visited regularly throughout the afternoon. 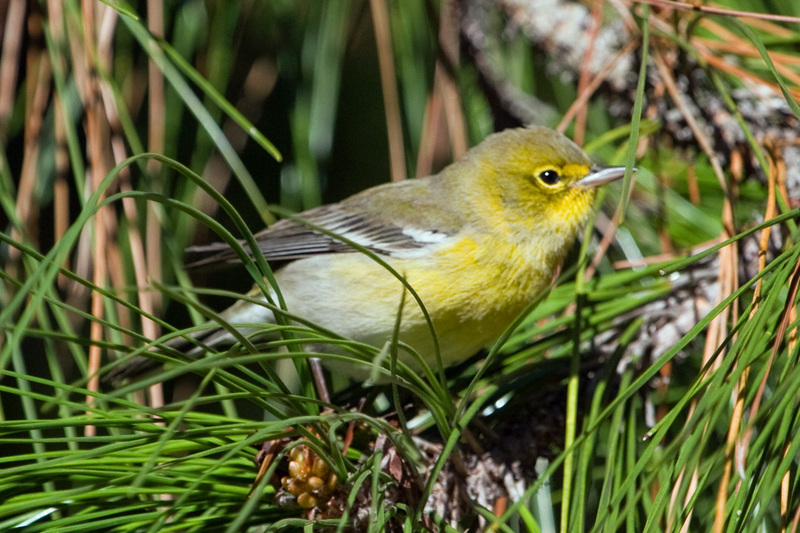 Also in the yard was a hermit thrush, pine warbler on the feeders, and a pair of ruby-crowned kinglets. I went down to Jekyll Island on Friday for the Fall Meeting of Georgia Ornithological Society. I took the opportunity to attend a shorebird workshop led by Kevin Karlson and go out with him and others in the field the next day. 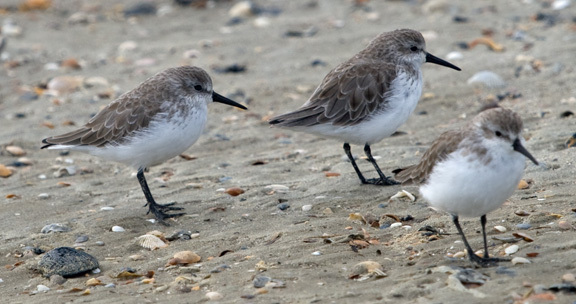 We spent a lot of time working on telling apart western and semipalmated sandpipers. 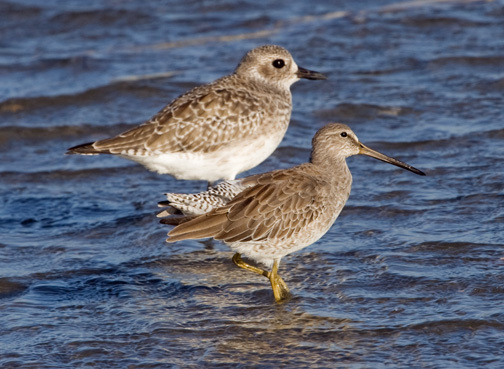 I learned that female westerns are larger and generally have longer beaks than male westerns, and the same goes for semipalmated sandpipers - females are larger than males. Westerns generally have a larger, rangier look and more block-shaped head. 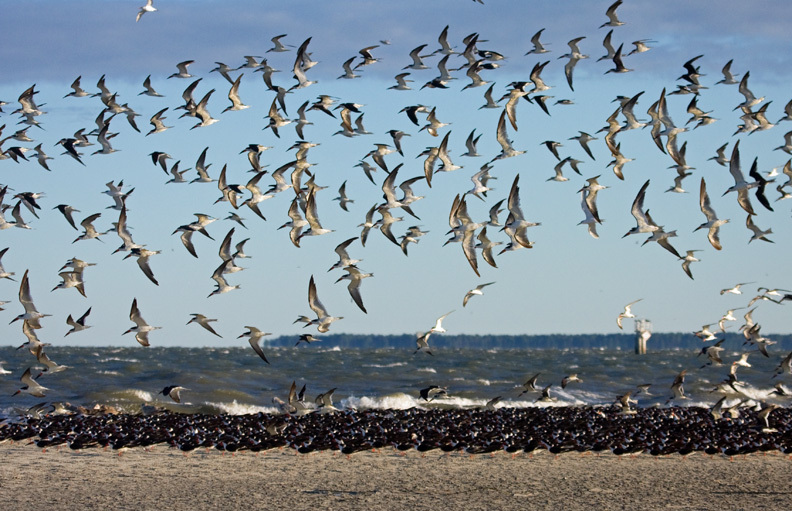 That said, when I returned to Tybee, I went out to check the beach at high tide and found lots of roosting birds. 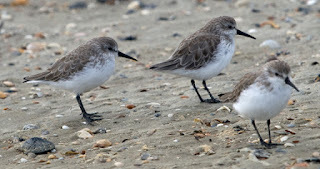 I think these are western sandpipers - maybe a smaller male on left and larger female on right, but I still have doubts and would welcome comments. One fun thing was seeing all the roseate spoonbills. They were roosting in a tree at high tide and then came down to feed on a mud bar. Definitely seem to be expanding their range northward. On East Beach at St. Simon's we found a piping plover that was banded. 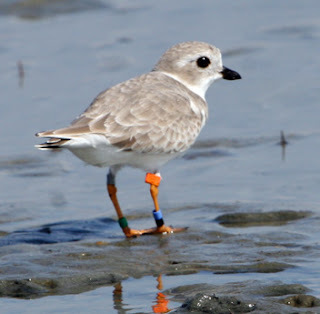 I sent a photo up to the University of Minnesota where Alice van Zoeren replied right away to say that the plover hatched in 2007 at Brevort, MI along the north shore of Lake Michigan in the upper peninsula. She was banded as an adult in 2009 at Gulliver, MI, a little to the west. WOW! Thanks Alice! Back on Tybee on Monday & Tuesday mornings, the nearly 9 foot high tide had lots of birds on the beach. There were 70 American Oystercatchers, 4 banded. Green CCY, Yellow N4, Blue CR & Vertical Red 6K. American Oystercatchers rest on the beach at high tide. The shorebirds were very cooperative with willets, black-bellied plovers and short-billed dowitchers posing side by side in good light. Willets, Black-bellied Plovers, Short-billed Dowitchers. the beach fishing as well as resting on the sand. 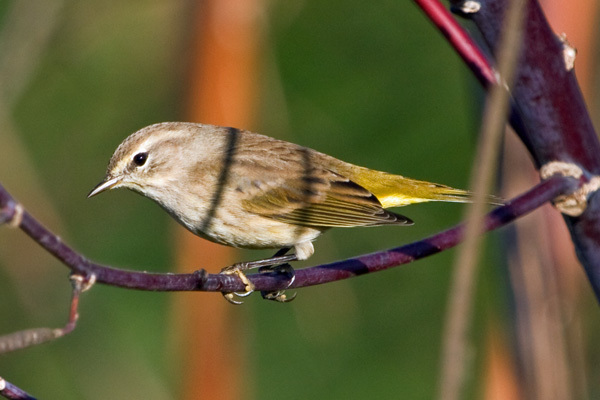 In the songbird arena, on the way to the beach, I saw my first of the season yellow-rumped warbler as well as a white-throated sparrow. There were many gray catbirds feeding on wax myrtle berries. 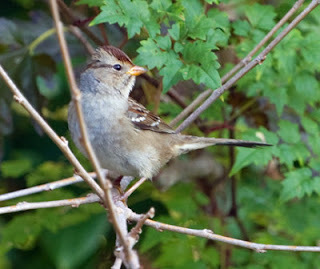 One surprise was this juvenile white-crowned sparrow! What a great few days of coastal birding!